Robots. Video Games. Smart phones. What do they all have in common? Sphero. The robotic ball that you control via your iOS or Android device is the flagship product of startup Orbotix. Not only is Sphero controlled by smart phone or tablet, but Orbotix intends much of the entertainment to come from augmented reality apps – digital images on the phone interact with the physical ball. That theory is now ready for testing. Orbotix just announced that preorders will begin shipping in December and that Sphero will be available to purchase on both their site and Amazon for $130. (Though they have so many preoders that new customers are unlikely to get their Sphero until 2012). Check out some cool new videos of Sphero below. With an open API, the fledgling AR robot is ready for developers everywhere to jump on board and start creating the first wave of killer applications and video games. Can Sphero become a breakout success or is the $130 price tag and out-of-this world concept too much for mainstream customers to handle? Along with the hype, Orbotix has released some crucial details of their robotic ball. Sphero is wirelessly charged by an induction coil, and has a battery life of about one hour of steady use. It’s range is up to fifty feet via Bluetooth connection – which is about as far as you’d really want for an object the size of a tennis ball that costs $130. The internal motors and gyros allow Sphero to maintain a straight course at good speeds, up to three feet per second. That’s not much more than 2 mph, but as seen in the video, Sphero’s speed is pretty fast given its size and agility. Perhaps most impressively, the internal LED lights can change Sphero’s appearance to any of “thousands of possible colors”. Definitely customizable, and quickly changeable with just a flick of the controls. For $130, Sphero will ship with the ball itself, and the inductive charger. The December launch will also include six apps that customers have the option of downloading via their smart phone or tablet. The first three are very basic: a platform and social networking app called simply “Sphero”, a moving app that rolls the robot around called “Drive”, and “Sphero-cam” which records videos while controlling Sphero so it can be shared with the world. Slightly more interesting is “Draw N’ Drive” which allows the controller to finger paint a path on the touchscreen and have Sphero follow the same trajectory. Similarly, there’s “Blox” – a programming style app that allows the user to arrange commands with a simple interface. “Chromo” and “Golf” are the only apps that can be called games with the former playing something like Simon and the latter being, well, augmented reality golf. Blox is a simple color coded programming-style app. Another cool idea, but not the most exciting of game concepts. Much of the buzz surrounding the device, however, is focused on the possible AR games that could easily be created for Sphero. Orbotix seems to have many such video games waiting just in the wings. 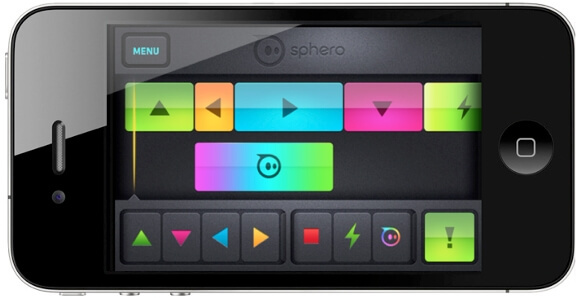 We’ve covered several such possibilities in our last review, but here’s one more cool app to check out: Sphero Pong. As with any toy or video game, Sphero’s fate rests largely on luck. Who knows if $130 is the right price point for a rolling robot you need a smart phone or tablet to really enjoy. Who knows if Orbotix’s strong preorder showing will translate into meaningful mainstream sales. Who knows if Q4 2011 will be lucrative enough for Sphero that they attract the flood of developers they’ll need to ultimately succeed (clearly six apps is a small start). Ultimately, it’s all just a crapshoot. We won’t really know until after the holiday shopping season.